This category features hand painted silk scarves on Silk Charmeuse. It is a lightweight 100% silk fabric with a satin weave. Silk Charmeuse is a rich and lush type of silk fabric that makes stunning scarves, and works great for every season and every style. Unisex Silk Scarf, Men, Women. Olive, Sage Green Hand Painted Silk Scarf TENDER OLIVE. Size 11x60. Anniversary Gift. Birthday Gift, Christmas Gift. 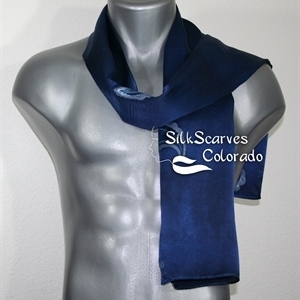 This is a 100% Silk Charmeuse unisex scarf - perfect as a gift for a man or for a woman. This scarf is divided into four sections by accent lines in light metallic green - each section featuring a shade of green: antique green, dark olive, light olive and silvery green. SIZE Medium: 11" x 60" (28 cm x 152 cm). This is original size - slight shrinkage occurs due to the steam-setting process. Unisex Silk Scarf, Men, Women. Brown, Mint Green Handmade Silk Scarf CUBAN MINT. Size 11x60. Anniversary Gift. Birthday Gift, Christmas Gift. This is a 100% Silk Charmeuse unisex scarf - perfect as a gift for a man or for a woman. Silk Charmeuse is a rich and luxurious silk fabric that makes very elegant scarves. This scarf features paisleys in muted metallic green and brown, on a background in a rich shade of olive green. SIZE MEDIUM: This is Size Medium scarf, the perfect everyday business or casual size: 11" x 60" (28 cm x 152 cm). This is original size - slight shrinkage occurs due to the steam-setting process. 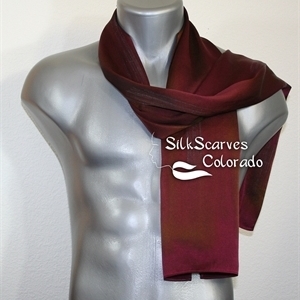 This is a 100% Silk Charmeuse unisex scarf - perfect as a gift for a man or for a woman. Silk Charmeuse is a rich and luxurious silk fabric that makes very elegant scarves. 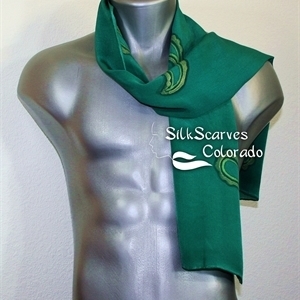 This scarf is in rich shade of emerald green, decorated with paisleys in metallic green. SIZE Medium: 11" x 60" (28 cm x 152 cm). This is original size - slight shrinkage occurs due to the steam-setting process. This is a 100% Silk Charmeuse unisex scarf - perfect as a gift for a man or for a woman. Silk Charmeuse is a rich and luxurious silk fabric that makes very elegant scarves. This scarf features paisleys in metallic silvery blue on a background that is a rich shade of ink blue. SIZE MEDIUM: This is Size Medium scarf, the perfect everyday business or casual size: 11" x 60" (28 cm x 152 cm). This is original size - slight shrinkage occurs due to the steam-setting process. Unisex Silk Scarf, Men, Women. Burgundy, Terracotta Handmade Silk Scarf CHOCOLATE MERLOT. Size 11x60. Anniversary Gift. Birthday Gift, Christmas Gift. Unisex Silk Scarf, Men, Women. Navy Blue Handpainted Silk Scarf OCEAN STEEL. Size 11x60. Anniversary Gift. Birthday Gift, Christmas Gift. This is a 100% Silk Charmeuse unisex scarf - perfect as a gift for a man or for a woman. Silk Charmeuse is a rich and luxurious silk fabric that makes very elegant scarves. This scarf is in the contrasting shades of dark and light: navy blue and steel blue, separated by an accent line in metallic silvery blue. SIZE Medium: 11" x 60" (28 cm x 152 cm). This is original size - slight shrinkage occurs due to the steam-setting process. Unisex Silk Scarf, Men, Women. Brown Handpainted Silk Scarf EXECUTIVE CHOCOLATE. Size 11x60. Anniversary Gift. Birthday Gift, Christmas Gift. This is a 100% Silk Charmeuse unisex scarf - perfect as a gift for a man or for a woman. Silk Charmeuse is a rich and luxurious silk fabric that makes very elegant scarves. This scarf is in rich chocolate brown, decorated at each end in contrasting shade of warm terracotta. Outlines done in metallic brown and topped with thin accents in copper. SIZE Medium: 11" x 60" (28 cm x 152 cm). This is original size - slight shrinkage occurs due to the steam-setting process. Unisex Silk Scarf, Men, Women. Silver Grey & Black Handmade Silk Scarf DARK SILVER. Size 11x60. Anniversary Gift. Birthday Gift, Christmas Gift.